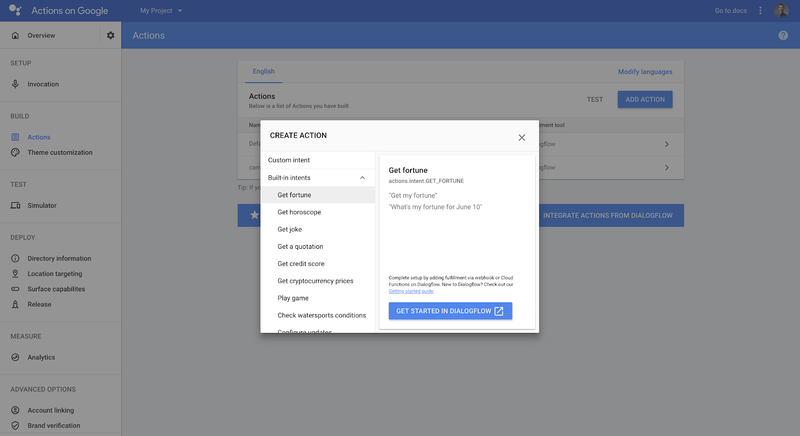 A couple months ago at Google I/O, we announced a redesigned Actions console that makes developing your Actions easier than ever before. 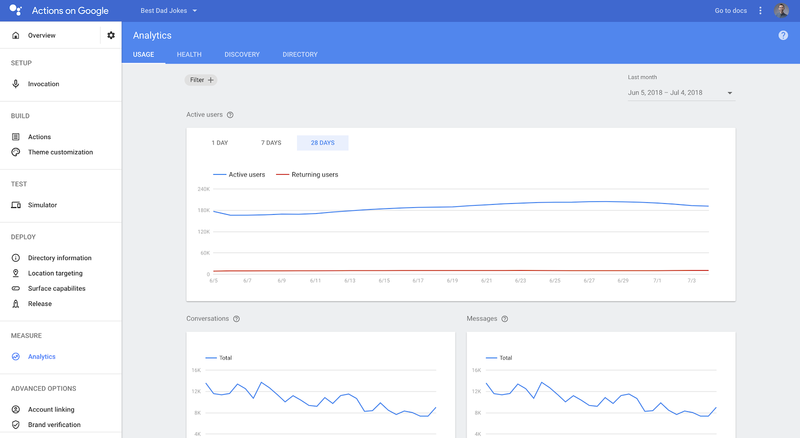 The new Actions console features a more seamless development experience that tailors your workflow from onboarding through deployment, with tailored analytics to manage your Actions post-launch. Simply select your use case during onboarding and the Actions console will guide you through the different stages of development. Here are 5 tips to help you create the best Actions for your content using our new console. Part of what makes the Actions on Google ecosystem so special is the vast array of devices that people can use to interact with your Actions. Some of these devices, including phones and our new smart displays, allow users to have rich visual interactions with your content. To help your Actions stand out, you can customize how these visual experiences appear to users of these devices. 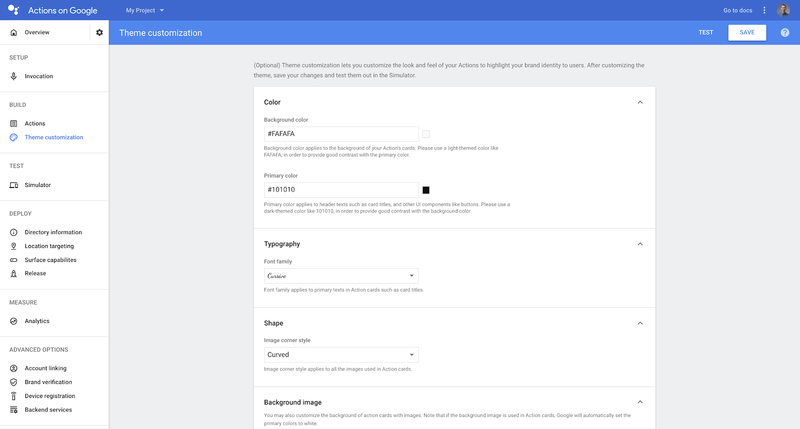 Simply visit the "Build" tab and go to theme customization in the Actions console where you can specify background images, typography, colors, and more for your Actions. Conversational experiences can introduce complexity in how people ask to complete a task related to your Action--a user could ask for a game in thousands of different ways ("play a game for me", "find a maps quiz", "I want some trivia"). Figuring out all of the ways a user might ask for your Action is difficult. To make this process much easier, we're beginning to map the ways users might ask for your Action into a taxonomy of built-in intents to abstract away this difficulty. 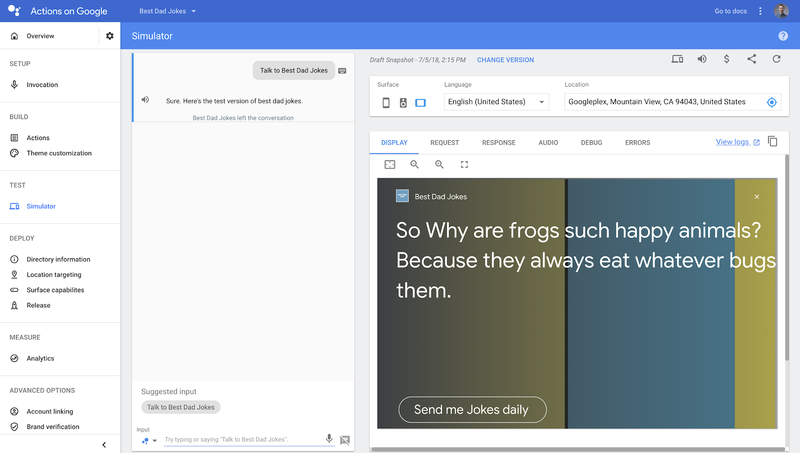 We'll start to use the built-in intent you associated with your Action to help users more easily discover your content as we begin testing them with user's queries. We'll continue to add many more built-in intents over the coming months to cover a variety of use cases. In the Actions console, go to the "Build" tab, click "Actions", then "Add Action" and select one to get started. 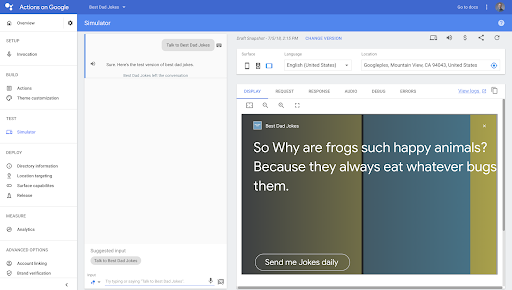 While we'll continue to improve the ways users find your Actions within the Assistant, we've also made it easier for users to find your Actions outside the Assistant. Driving new traffic to your Actions is as easy as a click with Action Links. You now have the ability to define hyperlinks for each of your Actions to be used on your website, social media, email newsletters, and more. These links will launch users directly into your Action. If used on a desktop, the link will take users to the directory page for your Action, where they'll have the ability to choose the device they want to try your Action on. To configure Action Links in the console, visit the "Build" tab, choose "Actions", and select the Action for which you would like to create a link. That's it! The best way to make sure that your Actions are working as intended is to test them using our updated web simulator. In the simulator, you can run through conversational user flows on phone, speaker, and even smart display device types. After you issue a request, you can see the visual response, request, and response JSON, with any potential errors. For further assistance with debugging errors, you also have the ability to view logs for your Actions. Another great opportunity to test your Actions is by deploying to limited audiences in alpha and beta environments. By deploying to the alpha environment, your Actions do not need to go through the review process, meaning you can quickly test with your users. 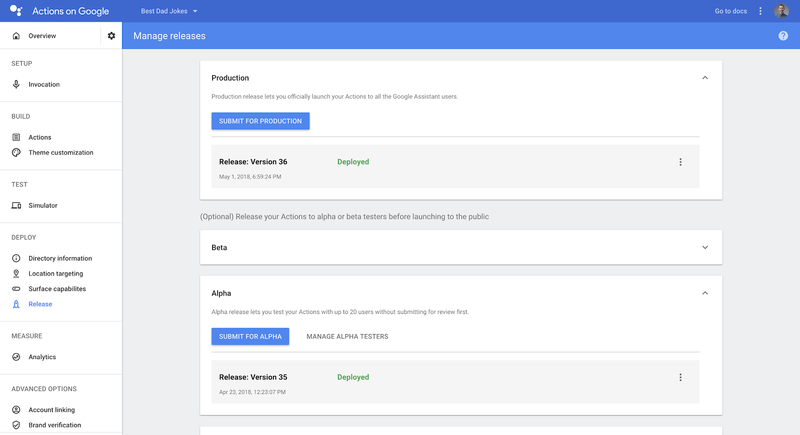 After deploying to the beta environment, you can launch your Actions to production whenever you like without additional review. To use alpha and beta environments, go to the "Deploy" tab and click "Release" in the Actions console. After you deploy your Actions, it's equally important to measure their performance. By visiting the "Measure" tab and clicking "Analytics" in the Actions console, you will be able to view rich analytics on usage, health, and discovery. You can easily see how many people are using and returning to your Actions, how many errors users are encountering, the phrases users are saying to discover your Actions, and much, much, more. These insights can help you improve your Actions. If you're new to the Actions console and looking for a quick way to get started, watch this video for an overview of the development process. We're so excited to see how you will use the new Actions console to create even more Actions for more use cases, with additional tools to improve and iterate. Happy building!